This article is about the historical organization of the late 19th century. For other uses, see Golden Dawn (disambiguation). The Hermetic Order of the Golden Dawn (Latin: Ordo Hermeticus Aurorae Aureae; or, more commonly, the Golden Dawn (Aurora Aurea)) was an organization devoted to the study and practice of the occult, metaphysics, and paranormal activities during the late 19th and early 20th centuries. Known as a magical order, the Hermetic Order of the Golden Dawn was active in Great Britain and focused its practices on theurgy and spiritual development. Many present-day concepts of ritual and magic that are at the centre of contemporary traditions, such as Wicca and Thelema, were inspired by the Golden Dawn, which became one of the largest single influences on 20th-century Western occultism. Rose Cross of the Golden Dawn. The three founders, William Robert Woodman, William Wynn Westcott and Samuel Liddell Mathers, were Freemasons. Westcott appears to have been the initial driving force behind the establishment of the Golden Dawn. The Golden Dawn system was based on hierarchy and initiation like the Masonic lodges; however women were admitted on an equal basis with men. The "Golden Dawn" was the first of three Orders, although all three are often collectively referred to as the "Golden Dawn". The First Order taught esoteric philosophy based on the Hermetic Qabalah and personal development through study and awareness of the four Classical Elements as well as the basics of astrology, tarot divination, and geomancy. 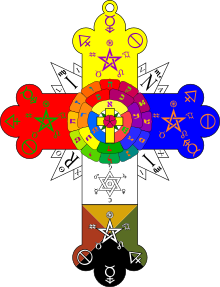 The Second or "Inner" Order, the Rosae Rubeae et Aureae Crucis (the Ruby Rose and Cross of Gold), taught magic, including scrying, astral travel, and alchemy. The Third Order was that of the "Secret Chiefs", who were said to be highly skilled; they supposedly directed the activities of the lower two orders by spirit communication with the Chiefs of the Second Order. The foundational documents of the original Order of the Golden Dawn, known as the Cipher Manuscripts, are written in English using the Trithemius cipher. The manuscripts give the specific outlines of the Grade Rituals of the Order and prescribe a curriculum of graduated teachings that encompass the Hermetic Qabalah, astrology, occult tarot, geomancy, and alchemy. In 1903, A. E. Waite and Blackden joined forces to retain the name Isis-Urania, while Felkin and other London members formed the Stella Matutina. Yeats remained in the Stella Matutina until 1921, while Brodie-Innes continued his Amen-Ra membership in Edinburgh. The Portal Grade was an "Invisible" or in-between grade separating the First Order from the Second Order. Dario Carpaneda (1856 - 1916) Italian occultist and esotericism professor at the University of Lausanne. W. B. Yeats (1865–1939), Irish poet, dramatist and writer. ^ a b Colquhoun, Ithell (1975) The Sword of Wisdom: MacGregor Mathers & the Golden Dawn. New York: G.P. Putnam's Sons. ^ Phillips, Julia (1991) History of Wicca in England: 1939 - present day. Lecture at the Wiccan Conference in Canberra, 1991. ^ Jenkins, Phillip (2000) Mystics and Messiahs: Cults and New Religions in American History, pg. 74. 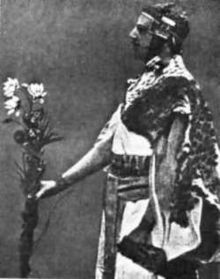 "Also in the 1880s, the tradition of ritual magic was revived in London by a group of Masonic adepts, who formed the Order of the Golden Dawn, which would prove an incalculable influence on the whole subsequent history of occultism." USA: Oxford University Press. ^ Smoley, Richard (1999) Hidden Wisdom: A Guide to the Western Inner Traditions, ppg 102-103. "Founded in 1888, the Golden Dawn lasted a mere twelve years before it was shattered by personal conflicts. At its height it probably had no more than a hundred members. Yet its influence on magic and esoteric thought in the English-speaking world would be hard to overestimate." USA: Quest Books. ^ Golden Dawn researcher R. A. Gilbert has found evidence which suggests that Westcott was instrumental in developing the Order's rituals from the Cipher Manuscripts. See Gilbert's article, From Cipher to Enigma: The Role of William Wynn Westcott in the Creation of the Hermetic Order of the Golden Dawn, from Carroll Runyon's book Secrets of the Golden Dawn Cypher Manuscripts. ^ a b Regardie, 1993, page 11. ^ Raine, Kathleen (1976) . Liam Miller (ed.). Yeats, the Tarot and the Golden Dawn. New Yeats Papers. II (second ed.). Dublin: Dolmen Press. p. 6. ^ a b Llewellyn Encyclopedia: "Golden Dawn Time Line"
^ Golden Dawn Research Center - What is the Golden Dawn? ^ Moyle, Franny (2011). Constance: The Tragic and Scandalous Life of Mrs Oscar Wilde. Hachette UK. p. 118. ISBN 9781848544611. ^ "Frederick Leigh Gardner", Biographies: Fringe freemasons, Grand Lodge of British Columbia and Yukon (Freemasons) web site. Retrieved November 2008. ^ Ravenscroft, Trevor (1982). The occult power behind the spear which pierced the side of Christ. Red Wheel. p. 165. ISBN 0-87728-547-0. ^ Picknett, Lynn (2004). The Templar Revelation: Secret Guardians of the True Identity of Christ. Simon and Schuster. p. 201. ISBN 0-7432-7325-7.